Having a better idea of drafting a bodice and some of the not so obvious issues involved in balance, I wished to consider what was important for an adaptable sleeve draft. Like many forum members the main draft I have used to learn shirt drafting is the Rundschau Shirt block from the 60s. It is quite a good demonstration of many features that are quite modern and systematic, in the way that German drafts are famous for. Unfortunately, the sleeve draft does not really follow that promising start. The Rundschau Sleeve draft is made on a folded sheet of paper. The determination of the cap height is prescribed as a proportion of the bust measurement and would be very difficult to alter. The cap height is short and designed for greater mobility rather than beauty. The contour of the cap is simple and not like modern sleeves. 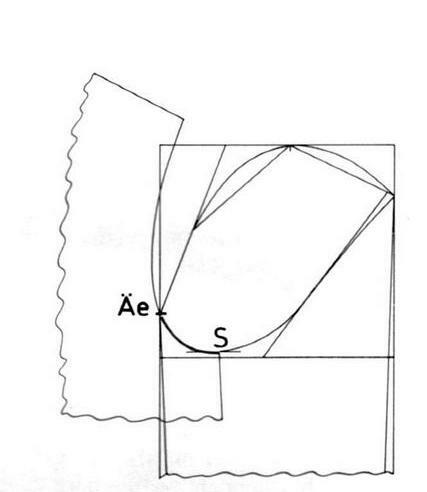 The maximum diameter of the sleeve is determined as the half scye measurement at a right angle from A, rather than using the scye measurements on the diagonal. I wanted a better way of looking at sleeves. Measured from the neck-line, over the shoulder to the wrist/carpal bones. Although, it has been said by Gramountoto that the sleeve end/cuff should end 8 cm from the thumb tip, it is also a fashion decision. This is a direct measure around the wrist at the widest part, keeping a finger under the tape to allow for ease. This must be derived from the bodice draft. This is a decision based on the function of the shirt. A working shirt, required to allow considerable range of movement needs a relatively short cap. A shirt that is required to have clean lines where movement is not required will allow a higher cap. For a more fitted shirt it might be desirable to measure the biceps and forearm. A useful sleeve draft must be able to accommodate all these variables. Edited by Schneiderfrei, 17 March 2015 - 03:55 AM. Parson’s draft is likely the oldest on the forum. It is said to be from 1949 but the graphics look older than that. It is very simple. The depth of the widest part is measured from the right angle and so the total scye seam is very large and blousy. The cap is shortish and is fixed. The cap contour is not shaped in a modern way. The length is almost fixed at 24 inches but an allowance can be made for the measurement of the arm length minus shoulder width and the entire cuff. The wrist width is a proportional amount based on scale. 1 from 0 = 3 ¾ in. 2 from 1 = ½ scye circumference — 3/8 in. 3 is midway 1 — 2; 4 from 3 = 5/8 in. 5 from 1= 24 in., or sleeve length less shoulder width and cuff. 6 from 5 = ¼ scale + 2 in. 2 in. from 6, on the under-sleeve, is the cuff slit — 6 in. long. To face this, a piece of material 6 ½ in. x 2 ¼ in. is required and is called the cuff-slit facing. The cuff measures ¼ scale + 1 in. x 2 ¾ in. and is cut with double edge as shown. A double cuff is ¼ scale + 1 in. x 6 in. A gusset, 3 ½ in. x 2 ½ in. (as shown), is required in the side-seam, 8 in. from waist. There is very little that is adaptable or variable and it would generally make an over full and blousant sleeve by modern standards. Edited by Schneiderfrei, 15 March 2015 - 11:47 AM. The Whife draft is also, according to Sator, likely older than the 1949 edition suggests. Again the scye seam is determined by the half scye measure applied to the perpendicular of a shallow sleeve cap. The cap in this case is specified to be a proportional measure based on the waist measure. The sleeve length is determined by subtracting the shoulder width and the entire cuff width. Again this will be a blousy sleeve that is only just long enough. The cuff at least is based on a direct measure. And the cap contour is shaped and quite modern looking. Measure round circumference of armhole of the body part. 2 is the sleeve length less the shoulder-seam 15 to 8 and the cuff width. Square out from points 1 and 2. 3 direct from point 0 = half the armhole measure. 4 is midway between 0 and 3. 5 from 4 = ¾”; shape back part of sleeve from 0 through 5. Shape front sleeve from 0 through 4. D from 2 = cuff width. 6 from D = 1½” for pleat. Curve sleeve at 7, ½” above the line. on under-part or back part of sleeve. Edited by Schneiderfrei, 15 March 2015 - 12:21 PM. The Rundschau Shirt draft on the forum is said to be from the 1950’s. The body is quite modern compared to the examples above. The sleeve draft is not quite so. The cap is short but is also a proportional measurement. The length requires the removal of the entire cuff width. But, the scye seam is a more modest amount than the two previous examples and shows some rudimentary shaping. The wrist is a direct measure. Unfortunately there is little room for adaptation or variation. Drawing up the sleeve and the cuff. This draft is from the 1960’s. The whole draft is highly proportionally based. There is even a mysterious measurement that is unfindable, Semiampiezza dorso as far as I can see. I would love to have an explanation/derivation of that term. The maximum width of the sleeve draft is set by the depth of the scye from the back draft. The scye seam is less than this measure by a diagonal reduction, so it might be less blousy than the first two sleeves in this discussion. There is a suggestion as to the scye seam contour to create shaping. The wrist width is based on a proportion that is internal to the sleeve draft itself, which seems fairly arbitrary. You can’t do many adjustments with this sleeve draft. 1 to 2 is 9 to 7 in the back (measure diagonally, not along the seam line) plus 2 cm. I find that the shape of the crown should not be the same in front and back, but it's up to you (it needs to be higher in the front and lower / flatter in the back to follow the shapes of the front and rear armholes, which have different curves). Edited by Schneiderfrei, 15 March 2015 - 12:13 PM. The Chaudry drafts below are from the 1970’s, the late 70’s according to Sator. They do seem to be a bit more modern. The cap is still proportional and short but the scye seam is a direct diagonal measurement which is shorter/slimmer than any of the drafts above. The whole cuff width is removed from the sleeve length, yielding a “just fits” length. The wrist width is proportional instead of measured. But, there is shaping of the sleeve cap contour, especially in the case of the “Fitted” version. 1 from 0 = 1/6 of scye circumference. 2 from 1 = ½ of scye circumference. 3 and 4 are dividing the line 2 – 1 into three equal parts. 5 from 4 = ¾” and 6 from 3 = 1/8” shape the front half of sleeve by joining 1 – 5 – 6 – 2. 7 from 5 = 3/8” and 8 from 6 = 5/8”; complete the rest of half back by joining 1-7-8-2. 9 from 1 is sleeve length less cuff. 10 from 9 = 3/8” square from 10 to 11 = 1/3 scale plus 3/8”; join 11 – 9 and 11 – 2. 12 is midway 11 – 9, located for the cuff opening 6” long. Hollow ¼” at point 12 for front half of sleeve. Each sleeve can be fitted with single or double cuffs. Square lines from point 0. 2 from 1 is half the armhole circumference. 3 and 4 divide the line 2 – 1 into three equal parts. 9 from 1 = the sleeve length, less the cuff and the back yoke width. Edited by Schneiderfrei, 15 March 2015 - 12:14 PM. The Onishenko draft, from 1985 seems a good modern draft. It has no proportional pretensions. The user may choose the sleeve cap height. The draft marks out biceps and elbow lines. The scye seam line is determined by the actual armscye diameter and is drawn on the diagonal yielding a generally slimmer sleeve overall. The finer points of the draft are provided in separate illustrations which I have not shown. Edited by Schneiderfrei, 17 March 2015 - 03:53 AM. The journey above is a historical one from a time when the shirt was not that closely analysed to a highly adaptable draft capable of being modified in many dimensions. I suspect that this is because prior to the 1950’s it was rare if not completely unacceptable to go about in an uncovered shirt and shirts were regarded very much as underwear. In that time a shirt simply needed to cover the body in a fairly fulsome way, so lots of cloth was the go. As it became more acceptable and more common to reveal the shirt a requirement came about to sharpen up the lines and refine the cut. The most modern Rundschau drafts must be more similar to the Onishenko, allowing many points of adjustment. My only exposure to a more modern Rundschau draft than the one above is a very grainy image posted by suitcust http://www.cutterandtailor.com/forum/index.php?showtopic=3766 last year shows an additional feature that the overall length of the sleeve is only reduced by a portion of the cuff width – 1/3 to ½ (confirmed by posaune). This would give a bit of gentle ease to the final sleeve compared to removing the entire cuff width. So, it would seem that the above shows a great reason to order the Rundschau Herren Hemd book. It would be great to see an example of their modern sleeve draft. Edited by Schneiderfrei, 15 March 2015 - 12:18 PM. Another option for a shirt sleeve is to draft like a ladies' jacket sleeve in the front. What does that mean? Well, you copy the front shirt armhole from the Äe (front sleeve pitch) to the side seam and apply that shape to your sleeve. This will give the shirt sleeve a nice hang without compromising the comfort a lot (if at all). This option works best with a higher sleeve cap/ crown used for a more formal (dress) shirt and will also allow you to have the seam of the sleeve not matching that of the shirt body (a signature element for high end RTW or bespoke shirts from Naples). Could you please explain what the front sleeve pitch is? I did follow the discussion previously re the Chanel Jacket. So I have seen that term but I have not found enough about pitch to be able to know what it refers to or how it is determined, especially in relation to a shirt. That is one reason I did not mention pitch in the posts above. Actually this is just the sort of question I was hoping to generate. Edited by Schneiderfrei, 15 March 2015 - 10:41 PM. She gives a very thorough sleeve draft for a Ladies bodice that is enlightening. The older sleeve draft shape also take into account the less fitted nature of the body of the shirt and the resulting armhole shape. If one is making men's shirts where the fit is closer to a woman's bodice, then the shirt sleeve draft has to change too. Thanks terri, I will do that. I have also read this article on a Sleeve System with Multiple Pitch Marks. I find I do not have an adequate understanding of what and why 'pitch' is referring to. Or, even, how and why you might go about manipulating them. In relation to shirts. Edited by Schneiderfrei, 15 March 2015 - 11:19 PM. How are the lettered pitch marks determined? I can't think they are arbitrary. And, The numbered levels? are there rules to this system? I don't mean to seem obtuse since the mechanics of forming the draft is written down but . . . . What does he mean by an "original front pitch?" or "true front pitch?" Actually, now I look with greater intent, it seems that the number marks correspond to points of change in the curve of the scye. Is that part of it? Edited by Schneiderfrei, 15 March 2015 - 11:31 PM. In Rundschau you have 2 "pitches". from front side seam to the vAe (front sleeve inset point) you set the sleeve in without ease - so SG suggested to you to copy the curve. You have a pitch in the sleeve and a corresponding in the bodice. From vAe to the next mark - the shoulder seam - you have to distribute the ease from the front sleeve cap. From side seam to hvAe (back sleeve inset point) you have in the corresponding sleeve pitch already added an ease about 0.5- 0.8 cm. As the sleeve of a shirt has no much ease that is nearly a problem at all. Not so with a jacket. In a jacket sleeve you have 10 to 12 % of the circ of the armhole in the sleeve cap (woman). In the above shown system you have the pitches set so that the sleeve cap has the ease distributed already between the pitches (in several steps) and if you match it into the armhole the sleeve goes in like charm. But as Paul has written, this draft is with seam allowance - very disturbing for me. Edited by posaune, 15 March 2015 - 11:42 PM. The Äe point (which acts as the front sleeve pitch) is usually 1/4 Ad (scye width) in the Rundschau system. Which gives it a higher position in the front armhole compared to the British systems. The sleeve pitch is slightly less important in shirt sleeves, since they are normally not tight and also don't follow the shape of the arm as much. For shirts it therefore matters less where you put the front pitch point, though it makes more sense to keep it at a certain distance from either the side seam and/ or the shoulder. Having a sort of jacket sleeve in a shirt gives the opportunity to actually play with the sleeve pitch to match it to the hang of the arms, should that be necessary. It also allows you to give the shirt armhole a different shape that has a more harmonic run at the bottom of the scye, since the majority of sleeves is sewn to the armhole before the side seams are sewn. It is a bit more work (which is why it's hardly ever done in factories), but it gives a more bespoke feel and look. You can keep the armhole pretty high and small and the shirt close to the body, so when you lift your arms the shirt doesn't get pulled up and out of the trousers. I can never understand the problems people set themselves with pattern cutting when starting out in garment making. It seems that they want to put the horse before the cart with their first attempt. This is not an attempt to criticise your post, Schneidfrei. It's just that you see it time and again on this forum. The desire to jump in with an advanced design, because it is in vogue or a must have right a way. A shirt is a shirt! (a loose fitting garment made with light material.) Now before someone dives in to shoot me down. I do know that fashions change and shirts are being made with thicker and heaver fabrics, but they are not structured garments like coats and jackets. So lets stick with a simple shirt to begin with. Anyone of the diagrams Shneidfrei posted would be OK for a shirt. The making up sequence commands this type of sleeve. Shoulders first, followed by the sleeve being sewn from the top of one sideseam to the other, followed by the sideseams and sleeve seams being sewn in one oporation. This is a simplistic way of looking at it, but that is it. To start a discussion on sleeve crown and sleeve caps, with pitches here and pitches there, is too confusing for beginners. Having said all that and got it off my chest, lets get back to the post by Schneidfrei. It has generated a good discussion, and there is good sound advice from SG and posane, as there always is. Pitches are placed in a pattern to help with the correct hang of the sleeve and also to provide correct distribution of the sleeve fullness. On a shirt sleeve you only need one pitch position, and that is the half way point on the top of sleeve, to correspond with the shoulder seam. The sleeve is only half and half as you would see if you ever press a shirt sleeve. The odd time I am asked for a shirt pattern, to draft the sleeve I divide the scye in half and measure diagonally from this point to the scye line, half of the scye circumference. In general the scye would be half the chest measure. I then divide the diagonal line into three. On the upper point I square up 1cm, on the lower point I square down 1cm from the diagonal. I then shape the sleeve head as shown in most of the diagrams posted, the rest of the sleeve as diagrams. No, no ranting is not a problem. I feel I should like to bring you a cup of tea. I should bring everyone a cup of tea. I really appreciate all this attention. I don't mean to tackle such problems but I get as far as I can and 'bang' - another wall to climb. And, Yes, the forum is a difficult place to do this but I don't have any other place. In the case of pitch I have found references to it but not what it means. I wonder where you could find out about what posaune said about the the stitching from the side seam to the front pitch point is without ease? Likely the Rundschau book would but then even if I saw it there I might not have had a clue as to the significance (bedeutung) until now. I see this discussion may be dangerously intersecting with coat talk, but that is not my intention. If you look at a jacket draft. On the top sleeve front, you will see a small notch or nick! This is the front sleeve pitch position. This mark corresponds with a similar point on the base of the front scye of the jacket, (the front pitch.) When you sew in a sleeve you place these points together. On the back pattern at the back scye, is another pitch mark or notch! This corresponds with the top of the hind arm seam when both top and under sleeves are sewn together. When sewing in the sleeve, starting with the front pitches together, the back pitch and hind arm seam must match. Any fullness or extra length between these two points must be eased in, in the area of the sleeve crown. This fullness could be 2.5cm -4cm depending on the type of fabric used. A thick tweed fabric such as Harris tweed would take even more than this. There is a lesser amount of fullness goes into the under sleeve. Some people add extra pitch points around the sleeve crown, to be more accurate when sewing in the fullness. Having said all that, a shirt sleeve does not need this amount of fullness.